I happened to see an advert for Arm & Hammer toothpaste on TV a couple of days ago, in which they cheerfully proclaimed that it contained “liquid calcium”. Calcium, on the left. With the metals. This brought me up short. First thing: calcium is a metal. Now, as a famous British movie star might say (or perhaps might not say), “not many people know that”. Ask a roomful of people if calcium is a metal and most of them will tell you it’s not. 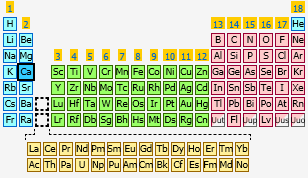 I’ve even heard students who know what the periodic table is and what the position of elements within it means, and who can see calcium right there on the left hand side, express their doubts. Everyone associates calcium with bones and teeth, possibly rocks at a push. No one (other than chemists of course) hears ‘calcium’ and thinks of a silvery-grey metal. But that is indeed what it is. It is a metal, and although its melting point isn’t huge in the grand scheme of metals, it’s still a fairly substantial 842 oC. The temperature in your bathroom is probably in the region of 20 oC. In fact your kitchen oven probably only goes up to about 240 oC, so the melting point of calcium is some 600 oC hotter than the hottest setting on your oven. Calcium and water: what you can’t see is how hot this sucker is going to get. Temperature problems aside, pure calcium is also highly reactive. Drop some in water and you’ll see a lot of violent bubbling followed by the solution turning white as a corrosive calcium hydroxide solution forms. The bubbling is due to flammable, potentially explosive, hydrogen gas. Oh, and it will get really, really hot too – this is what chemists call an exothermic reaction. I for one will confess to once (many, many years ago, of course) dropping a red-hot boiling tube into which I’d popped just a little too much calcium metal. After it had also bubbled up and covered my hand with the aforementioned calcium hydroxide. Ooopsie. (Fear not, my hand survived unscathed, after the application of copious amounts of cold water – the go-to cure for most chemical exposures). So, at the risk of stating the obvious, there’s no liquid calcium in Arm & Hammer toothpaste. And a jolly good thing too. Ah, now we get to the truth of the matter. It’s not liquid calcium, but calcium ions in solution. Does this matter? Am I being unnecessarily pedantic? Liquid/solution, calcium metal/calcium ions, what’s the difference? When an extra O really matters. Well, the thing is, chemists are pedantic. See, in chemistry, it genuinely could be a matter of life and death. Ethanol, for example, is ‘drinking’ alcohol. It’s the stuff in beer, and wine, and strawberry daiquiris. It may not be exactly healthy, but most adults can consume some fairly safely. Ethanal, on the other hand, is a toxic and probably carcinogenic substance that’s mainly used industrially as a starting point to make other chemicals. To pick another example, chlorine is a highly toxic gas that’s been used in chemical warfare; chloride ions are found in salt and are consumed perfectly safely every day. The difference between ions (atoms or molecules which have become charged due to the gain, or loss, of electrons) and atoms is really quite critical in chemistry, and in life in general. 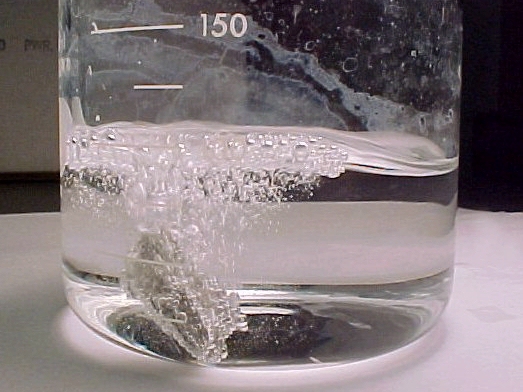 Potassium reacting with water – pretty! ‘Everybody’ knows that bananas contain lots of potassium. But potassium is another highly-reactive metal. In fact it’s even more reactive than calcium. 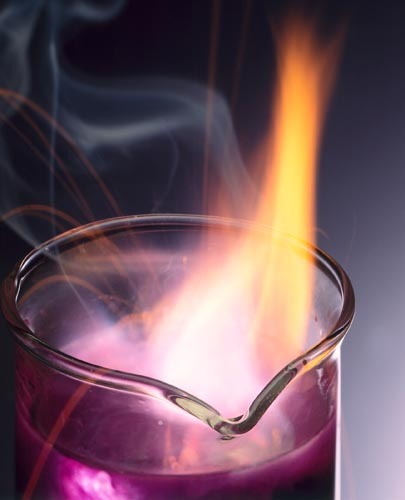 Potassium explodes with a rather beautiful lilac flame in contact with water. It’s pretty to watch, but you wouldn’t want it in your mouth. Actually bananas contain potassium ions (and just to really mess with everything you thought you knew, not even that much compared to lots of other foods). Back to the dubious labelling again, It’s interesting that Arm & Hammer have chosen to say “fluoride” – which specifically, and correctly, refers to fluoride ions – and not “liquid fluorine”. I mean surely, in the spirit of consistency, it should be liquid fluorine and liquid calcium (argh! 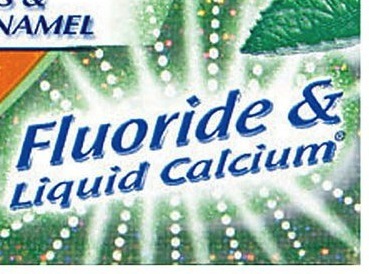 ), or fluoride ions and calcium ions. The word liquid has a specific meaning in chemistry. It means a pure element or compound in its molten state. Pure water at room temperature is a liquid. So is ethanol, and mercury, and bromine (interestingly these last two are the only chemical elements which are liquids at room temperature). Ethanol dissolved in water, as it is in strawberry daiquiris (more or less), isn’t a liquid. It’s a solution. This matters. Liquid ethanol is pure ethanol. Drink that and you’re looking serious alcohol poisoning in the face, and it’s about to wallop you for looking at it funny. An Arm & Hammer chemist? Saying, or even implying, that calcium ions in solution is ‘liquid calcium’ is like saying that seawater is liquid sodium (sodium is another highly reactive metal – orange flame this time). It’s just nonsense. Ok, it’s probably not going to cause anyone any actual harm, but that’s not the point. It’s completely factually inaccurate. I am absolutely certain that the chemists working for Arm & Hammer wanted to tear their hair out when the advertising company came up with this name for the formulation they’d spent (probably) years slaving over. And I expect they were essentially told to shut up about it, the vast majority of our customers won’t know the difference. And sadly this may be true. But it shouldn’t be. Would Arm & Hammer care if their boxes were labelled ‘tothpast’ instead of toothpaste? I bet they’d be bothered if the boxes were priced at £250 instead of £2.50. Why fuss over spelling and numbers but be careless over scientific literacy? Either precision matters or it doesn’t. Perhaps it’s time scientists starting making as much noise about this kind of thing as people who complain about stray apostrophes or the misuse of the word disinterest. You never know, it might help levels of scientific understanding. This entry was posted in Chemistry in the media, Cosmetics, Elements, Everyday chemistry and tagged Arm & Hammer, calcium, chlorine, ion, liquid, liquid calcium, literacy, potassium, sodium, solution, Toothpaste by katlday. Bookmark the permalink. Great post – this kind of thing is really important so I don’t think you’re making an unnecessary fuss (which you seem to imply at the end). I guess according to their logic, there’s also liquid nitrogen in their toothpaste, which is something else entirely! I agree with your ‘rant’, as I too have witnessed what I would consider atrocious and misleading science. Thank you for this post. I too feel that this is a subject which requires more attention. I do have to say however, that your description of temperatures similarly misleading. The melting point of calcium (842 C, 1115 K, 1460 F) is not 3x hotter than the maximum temperature of your oven (240 C, 513 K, 464 F). We are all guilty of these offenses one time or another, conscious or not. Good point, thank you! You’re quite right. I’ll fix it. Part of me thinks you’re making a fuss about nothing while the other says that you have a point. Liquid Calcium™ is clearly a trademarked name and a marketing term. It is designed to get consumers to buy a product. Now, whether having a greater concentration of calcium and phosphate ions in solution will help any remains to be seen but the term is not being used to explain science. The site does talk about ions. I would be more concerned about its dubious claims and how their trials were done. I agree that we should get the science right when communicating to people but we also shouldn’t make sh!t up to sell a product. Is there any evidence that more ions enable more efficient re-mineralization? I’d be more concerned that companies are allowed to sell a lie than foist a bad marketing term on people. In doing so, in presenting these logical inconsistencies to a public does more to damage people’s understanding of science than the use of terms like Liquid Calcium™. Of course, I could be wrong and increasing the concentration of calcium and phosphate ions in solution will enable better re-mineralization. It doesn’t change the fact that companies still push bad science on people. Actually, that’s a good point. Another subject to Ask for Evidence about perhaps? I know what you mean that perhaps it’s a fuss about nothing, but, but, would anyone even consider… I don’t know… something labelled “Hastings Battle 1055 ™ “? I don’t think so, even with the trademark. It’s just too wrong. At yet it’s fine to play fast and loose with scientific terms. I think that’s wrong. These things seep into our, and that of our children’s, consciousness whether we realise it or not. I remember (at least, I think I do…) that at one point the O2 logo had the 2 as a superscript. Oh the trouble I had persuading students not to write O2! Does it matter? Well, yes, because it’s wrong. We can’t complain about a lack of scientific literacy on the one hand, and then not care about this sort of thing on the other.